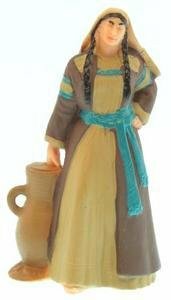 3" Sariah, made out of durable vinyl. Sariah is a beautiful Hebrew name that means Princess of the Lord. Sariah was Lehi's wife, and the mother of Laman, Lemuel, Sam, Nephi, Jacob, Joseph, and several daughters. Leaving her comfortable home behind in Jerusalem, she traveled with her family into the wilderness as the Lord directed. Sariah, a virtuous and faithful woman, is a great example to read about in The Book of Mormon.